Chaat is the most fascinating culinary concoctions prepared in the street corners or gallis of every city/town of our country. Isn’t the smell of street food enticing? Isn’t it exciting to watch the street food vendor swiftly assemble a plate of Chaat with all its colorful assortment of spices and chutneys? Just one mouthful is enough to relish the contrasting flavors with gusto. Its probably the best snack one has devoured, leaving with an after taste that is hard to forget. 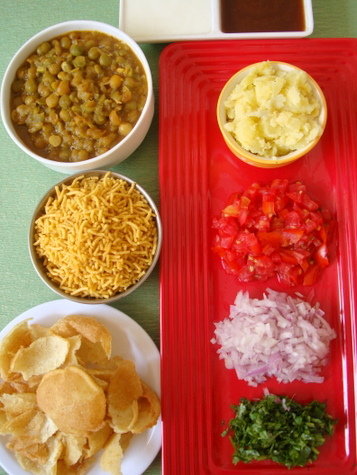 Each region has its version of Masala Puri aka Ragda Puri. A Chaat special that has curried peas aka ragda as a topping over crushed puris, a smothering of meeta chutney and green chutney and finished off with sev. 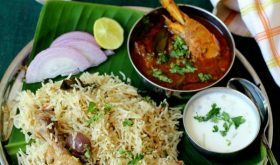 A popular quick eat that is lip smacking delicious! 1 Heat oil in a vessel, add the cumin seeds and let them splutter. Add green chillis and grated ginger and saute for 4-5 seconds. Immediately add the asafoetida, followed by the onion. Cook on medium heat for 4-5 mts. 2 Add the spice pwds (except garam masala pwd) and salt. Combine well. Add the tomatoes and cook until soft. 3 Add the boiled peas (keep aside 3 tbsps of boiled channa and mash them). Add a cup of water and cook on high heat for another 3-4 mts. Reduce flame and cook on simmer for another 7-8 mts. Add the mashed channa and combine. Add the tamarind paste, combine and cook for another 3-4 mts. 4 While the ragda is simmering add garam masala pwd. The gravy will begin to thicken. Adjust the salt. Garnish with fresh coriander leaves. 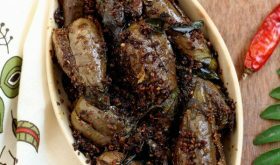 5 Serve hot with bhatura or rotis or proceed to prepare Ragda patties or Masala Puri. 1 Combine all the mentioned ingredients (except oil for deep frying), adding water slowly and make a dough. Leave aside covered with damp cloth for 30 mts. 2 Knead the dough again. Pinch off some dough and make very small balls. Roll out small thin rotis, using the rim of a container to cut out the round shape. 3 Heat enough oil for deep frying in a heavy bottomed vessel. It should be on medium high and once its hot, slide the roti into the hot oil and using the back of the ladle, press in the center and along the edges and you will find it will puff. Flip over and fry the other side till light golden brown. Don’t fry too much as it will turns too dark. Remove on to absorbent paper. Note: Ensure the oil is hot enough before frying the puri. If the oil is not hot enough, the roti will absorb a lot of oil. In case you do not have urad dal flour, replace it with 1/2 cup of maida. If made ahead of time, lightly warm in oven for 3-4 mts before serving. Instead of water, you can use soda water (fizz) to make the dough. Ensure to roll out very think puris. And use very fine sooji. Take a wide serving plate. 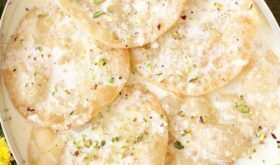 Crush some puris or papdi and prepare the first layer, next layer with mashed potato. Over that spoon the warm ragda along with enough gravy. Sprinkle chopped onion and tomato. Spoon some green chutney and sweet tamarind chutney. Spoon sweetened curd/dahi (purely optional). Finally finish off with coriander leaves, a pinch of saunf pwd (optional) and sev. Serve immediately. Best savored when ragda is warm. Wonderful chat recepies series you have… each one is mouth watering and worth trying. Thanks for all the chat recipes, Sailu. Can we prepare ragda with chickpeas? Ragda is usually prepared with dried peas. 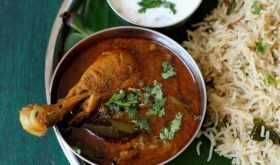 You have to use dried peas for the authentic ragda flavor. 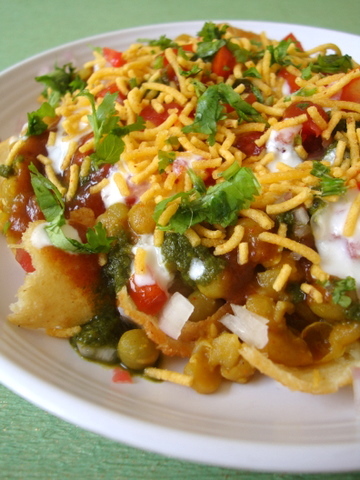 You are in chaat mood ! Sailu garu photos are amazing!! 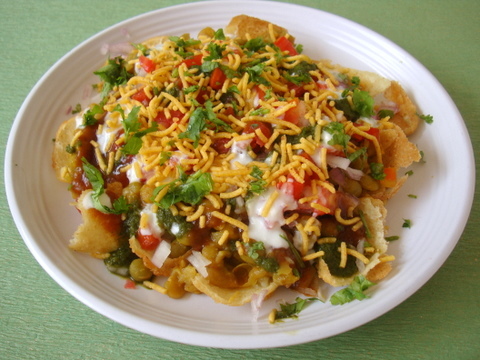 mmmm..chaat series is full on..all are droolworthy..and yummy. I live in New Zealand and daily visit your website for new recipes. I have tried your pani poori, masala poori, aloo tikki and all of them turned out well and also your egg biryani is excellent. next try is your mutton biryani cooker version. also i tried ur pasta yesterday and whatever i tried ,they all r really very very tasty and i got a lot of praises, all the credit goes to you. Thanks for posting such nice recipes. Mam, your recipes are excellent. 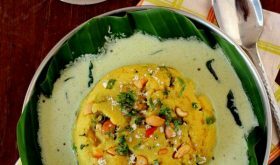 For urad dal flour, do we have to fry the dal before powdering it? Please explain. 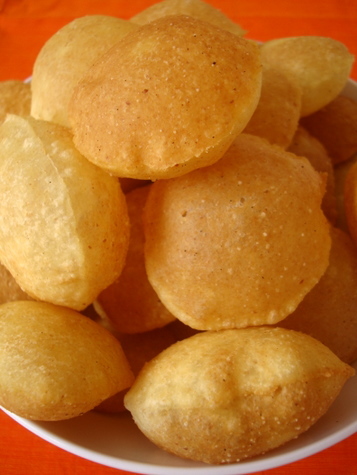 Yes, you can use store bought pani pooris. I felt with the taste….such a tasty one, Hmm………yummmmmmmmy…….